Mount Hosmer Park in Lansing, Iowa perches on a bluff overlooking the mighty Mississippi River and provides an excellent view of the Upper Mississippi River National Wildlife and Fish Refuge. This Refuge is over 194,000 acres and was formed in 1924, before the locks and dams were constructed along the River. 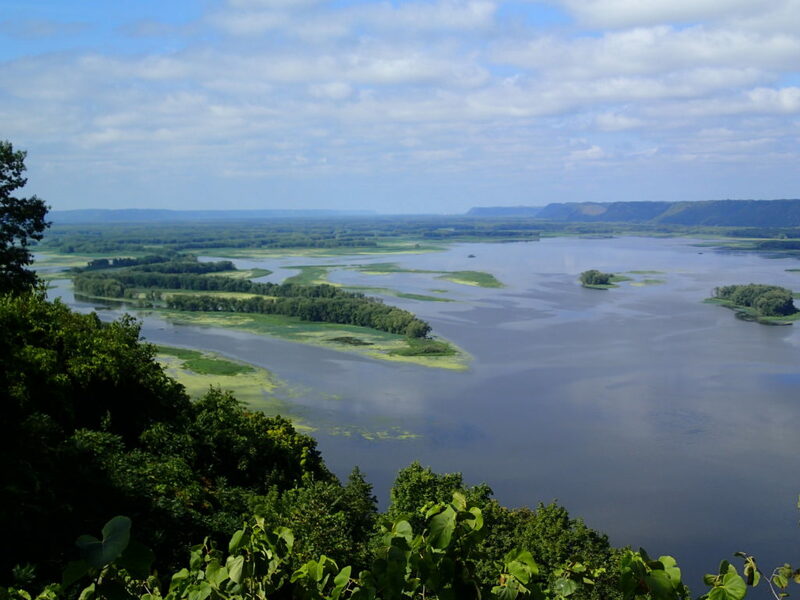 The 26 locks and dams that were installed on the Upper Mississippi greatly impacted the ecology of the river, as well as the Refuge. Because the purpose of managing water level is for commercial navigation, the once free-flowing and seasonally-fluctuating river is now a deeper, stabilized water system. The Refuge’s main focus is restoring riverine habitats through wetland, grassland/forest, and fish management. Projects include active water level management, restoration of native grass prairie, bank stabilization, oxygenation of backwaters, waterfowl banding, and dredging areas for over-wintering fish.